Sales,I just wanted to take a few minutes to say thank you for your repeated help when I install your water softeners. After each installation I always call and talk to Charlie to properly program the softener correctly. Each and every time Charlie walks me through the programming and makes sure I am in good shape before we hang up. I just installed the fifth softener I have purchased from you and will continue to offer your products. Once again I just thank you for your help. 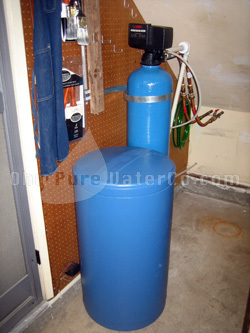 Hi Jean,I finally got my water softener installed and it works perfectly. I took a few pictures of the finished installation. I was able to conceal all of the pipes because we re-piped our entire house because of a leak under our concrete slab. Thanks for all your help, I could not have done it without you and Charley Moore. Charlie,Thanks for the good equipment and advice. My new water system is in place and functioning well. 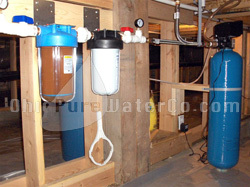 Even with no chlorine addition the sediment filter is able to remove odors. And the water pressure drop is minimal. CK,Thanks for the download. I’ve now connected with you, Jean and Dave. I ordered the softener with Dave on Wednesday and it was on my porch Thursday not too shabby. All appears in order and plumber will install tomorrow. CK,I am handy with some things but plumbing is not one of them. Thanks to your terrific installation instructions, I was able to replace my softener myself and save hundreds of dollars. CK,Got the system installed and working this weekend. I’ve attached a picture. Works Great! 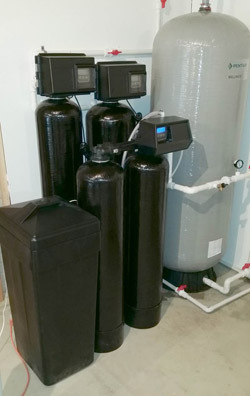 CK,I recently completed the installation of my new Fleck 9100SXT water softener along with whole-house filtration (3X 20″ big blue filters). I could not be happier with the products that I was sold or the service that was provided. Through the entire order process Charlie was patient and helpful in deciding which equipment would be right for my situation. When I decided that one of the components I had purchased wasn’t needed, OPWC returned it without any hassles. Highly recommend, would and will do business with again if the need ever arises. 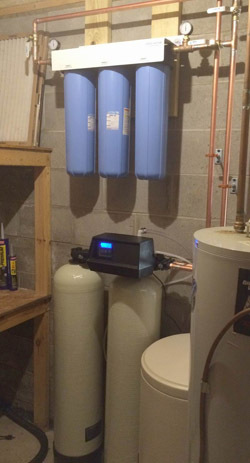 CK,Thanks for all your help getting this done, I am pretty sure I saved a couple thousand dollars based on the cost of my original water softener bought from Culligan 10 years ago. As promised here is an installation picture. Installation photos from Mr. Vechnyak. Jean,Just wanted you to know how appreciative we are for all your help. Our well water is great again and clothes are clean. It is so nice to have people in this world that will take their time to make sure we have everything we need. Tell everyone that we said thank you. JOB WELL DONE. Dear Charles and Jean,Finally I am able to get the photo of our system on the computer. I’m still not sure how to use this photo system. Thank you so much for your patience and assistance. We are really happy with our water now. It has never been this good in the 39 years we have lived in this house. CK,I want to start by saying I do not do install water softeners, purification or Stenner systems for a living. I’m in the tech industry. With that being said it was hard to fail after reading the instructions laid out by CK. He was able to walk me through the entire process and let me know what to do and what not to do. The service provided by Ohio Pure Water was impeccable. You really do not see this level of service anywhere, any more and it was a pleasant change. In addition the prices of the products were great and CK was able to work with me to figure out what I needed and what I did not. Thanks for all your help to decide which system to be used and typical usage in Thailand. 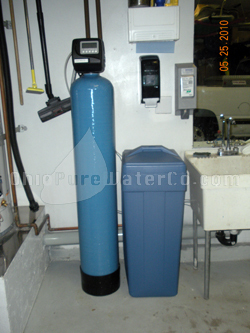 I am very happy with the water softener system and it works great. My problem with hard water is finally solved . Water hardness went down from 29 gpg to 0 (Zero). I could not find a reliable company in Thailand and more over they had no idea what they were selling. 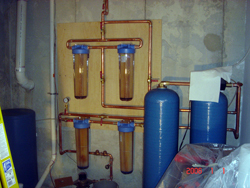 Regeneration of a water softener with salt, Huh ??? ?, Brine tank ?? ?, automated regeneration ?? 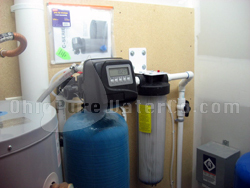 When discovering this â€œno knowledgeâ€ in the region I live in Thailand I found your great website with comprehensive information made it more clear to me how water softeners work and how to install. And your pricing is OK! Again, thanks for all and I will recommend your company when expats are looking for a water softener on the various related websites for expats in Thailand. I hope you get many more orders from Thailand. 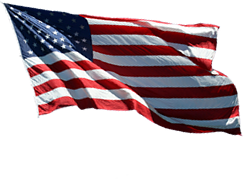 Just a quick thank you for your excellent service! 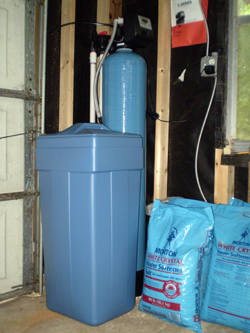 Softener system is of very high quality and was priced competitively, well packaged and expedited as I requested. It’s clearly apparent that y’all collaborate internally and effectively communicate with your customers. I was pleasantly surprised to find OPWC tailored installation instructions (perfect) delivered via email unsolicited. CK,Thanks for the programming help on the phone. Everything went together quick and easy. This system is a great value for the money and will be easy to service. I will definitely recommend your company to my friends. Feel free to quote me. Attached are some pictures. I talked to you last week about my fleck 9000 valve continuously running. You recommended rebuilding the upper and lower pistons and seals. You even walked me thru how to take it apart and replace the items. I ordered the parts and they arrived Friday. I spent 3 hrs this morning taking the valve apart, removing the seals and pistons and then putting the new stuff in. I got it back together and it is working great. No leak, no continuously running. It went thru a cycle and shut off correctly. I mentioned that a piston was leaking which is why we went this route. Well the upper piston was broke.The white part came off with the module and the rest of it was in the valve with the seals. That could of been the start of my problem. Last year I had to replace the module because my switches were being crushed. At that time the same piece of the piston came out with the module but I didn’t realize it was broken so I just put it back. Now the valve looks like it’s operating correctly again. Thank you so much for taking the time and walking me thru what needed to be done. This is the 2nd time you helped me. I’m hesitant to do mechanical work because I don’t feel I put things back together correctly. But you taking the time to walk me thru it gave me the confidence to do it. Your support does wonders. Thanks again. It’s the people that make the company. I spoke with Jean today while determining my water softener needs and she was AMAZING. She was friendly, professional, and knowledgeable. I was impressed that she called me back when she said she would, and that she had done independent research between our conversations so she’d have even more information for me, and I feel very confident that I’m going with the right softener. 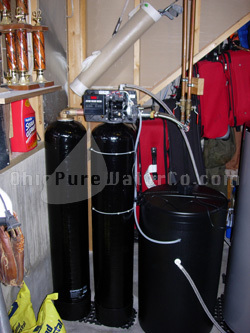 I have been shopping around at various online water softener companies, and have spoken to several customer service representatives at other places, and I can assure you that it was Jean’s service that earned Ohio Pure Water this sale. Ohio Pure Water has been absolutely the best! From sales, where they answered all of my questions (quite patiently, I might add, as I am a novice when it comes to water softeners), to assistance after I ran into problems (of my own making) during installation. CK,I installed the system last weekend and instantly solved the water problem that we had been “dealing with” for several years. I wanted to let you know that after extensive internet research and quotes from three local water purification companies your service, product & communication were the best. All of the local companies wanted to sell me a softener, chlorine injection system, air injection, holding tanks or combinations of each. No one even mentioned a Filox system, and quotes ranged from $1800 to $6000. So, that said, I ended up saving a grand, on the low side, buying from your company & installing myself. The install took about 3 hours, setting the system up, plumbing the main lines, installing a trap in the main sewer line and plumbing the drain. Fairly simple & only about $170 in parts. Thanks again and here’s a picture if you’d like to post on your site. Mr. Moore,Here’s a testimonial and picture for your website. I heard about how good your company and products were from a couple different internet forums. I had quotes for similar installations at two to four times what I paid. I like the electronic Fleck valve to see the water usage and the next regeneration cycle. 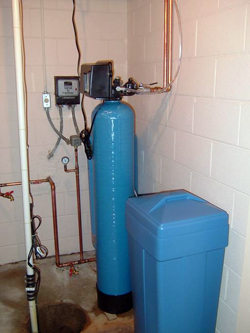 You helped me choose the perfect water softener for my family’s situation. As you can see in the picture, I installed it only on the hot water due to the location of our main and ease of installation. Our dishes are sparkling bright out of the dishwasher. We notice the difference even in warm water (mixed) situations. We liked it so much that I also installed a hose bib for washing our cars and the hot and cold water inlets for washing our clothes. We can feel the difference. Our water hardness went from 21+ to 0 as verified with water hardness test strips. David,Here is a photo of the installation. Unfortunately I had to rip out all of the PVC where it came into the garage and replace with CPVC to comply with San Antonio code (never saw the requirement in the plumbing code on the city website). I also want to express the ease of installation, especially for me who has no plumbing experience. Charlie,I received the replacement UV bulb yesterday that you sent based on the fact that the first one was broken when the contained was opened. Unfortunately, I had opened the first container several months after I ordered it and never opened it when it arrived to check to see if it was OK. So, despite the fact that you were under no obligation to replace it, I want you to know that I really appreciate you doing this. The new bulb arrived intact and I will get it installed right away. I also want you to know that for all future business I will return to Ohio Pure Water Co given the high level of service you provide to customers like me. Thank you for replacing that bulb, and rest assured that all future shipments will be checked right away upon arrival. 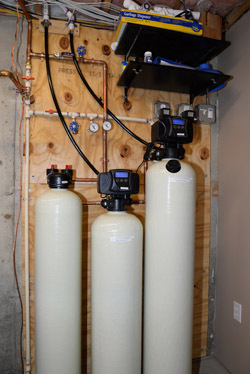 Charlie,Just want to let you know that I finally got around to finishing the installation of our new Fleck 2510SXT based 32,000 grain water softener system. I’m very happy with it. The 2510 valve seems very well built, and the SXT controller makes it a snap to program and to see what is going on with the system. A major upgrade from our old system. I’m planning on adding a surge arrestor to the electrical outlet before the summer thunderstorm season hits. I’ve attached a picture of the installation. From the website, ordering, shipping, receiving and installation, the Fleck 5600SXT was problem free and easy to install. The price is right for the unit as I had received a quote from the local Culligan dealership for a unit that was over $2,100 which was outside my budget for soft water. The product I ordered is doing everything I expect taking my water from 272 ppm to 0. Included is a shot of my installation which took a few hours to complete and all instructions were easy to follow. Dear Charlie,I just wanted to thank you for all your help in getting my water softener back up and running. In this day and age where customer service is more like customer dis-service, it is refreshing to deal with a company that takes an interest in making sure that the customer is treated well. Your efforts are recognized, and I am wanted to acknowledge you and your company for your efforts. 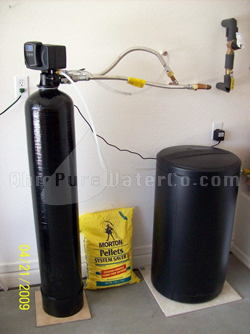 Hello,I recently purchased a PH neutralization system from your company and I just wanted to send you an email saying thanks for the help and having such clear installation instructions posted on your website. I believe I spoke with Charlie when I called and he helped me size the correct unit and recommended the SS bypass value, great suggestions. It is difficult to find good service in todays business world. We strive to offer it at my family’s sawmill, but overall it seems like way to many transactions involves a call to an automated 800 number. Anyway, I just wanted to let you know that your service is appreciated. Keep up the great work and I wish you the best in the new year. Charlie,Just wanted to say thanks for all of the help. Your customer service is top notch and your prices are great! Thanks for the fast shipment!I got everything friday afternoon and had it installed saturday afternoon. No problems. I followed the very helpful install instructions from your website. Here are a couple of pictures (as the install instructions pdf suggests). I’m not sure if you can tell by the pics but I was replacing an older Fleck 5600 installation that had been put in by a local plumber with plastic pipe and I kind of prefer copper whenever I can. So, I went copper from the bypass valve to a right angle and then used those ‘sharkbite’ connectors to connect between the copper pipe and the plastic pipe. (besides the fewer copper connections I have to make the less chance of a leak). Charlie,Thanks for your help on the phone with the programming on my Fleck 5600SXT Unit. I just got finished with all the plumbing and fired up my system. 5 hours in all. No leaks- thank God. Everything went smoothly considering I’m an amateur when it comes to plumbing. Being a Broadcast Engineer, I know electrical stuff pretty well, but I’m not intimidated by plumbing either. I have done copper before, but never CPVC. It’s definitely much easier doing cut and glue than soldering. I can’t wait to sample the new soft water. Here is a picture of my modest installation. I permanently bypassed my outside hose bibs so I never have to worry about switching the bypass valve every time I want to water the yard. I’ll be in touch to let you know how we like the water after a few days and once our hot water tank turns over its load of untreated water. Hello Mr. Moore,Thank you for all your help and suggestions. 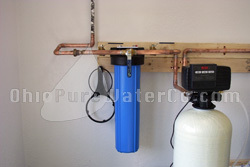 I successfully installed a water softener, a RO unit, as well as replacing 90 lbs of 70 yr old galvanized steel with copper. I will definitely recommend your company to friends and family. Here is a pic of the install. Hi Charlie,Here is a photo of the installed Clack WS1EE. It is working beautifully. 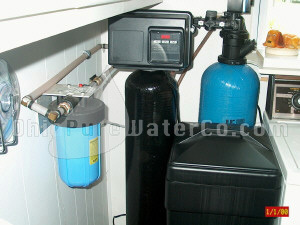 Mr. Moore,Enclosed are photos of my Clack WS1 48000 water softener. Thank you for all your great help your instruction manuals were very well written. I thoroughly enjoyed working with you. And look forward to working with you again in the future. My neighbors are already questing me on my new purchase and probably will be contacting you soon. Hi Charlie,Thanks for the info. My family is already complaining about me monitoring the water usage. Gonna put key locks on the bathroom door next to control. Here is a picture of my installation. I install sterilization and decontamination washers in hospitals so I can get a little carried away. My company is out of Mentor Ohio, STERIS Corporation. Let me know what you think. Thanks for the help with the valve set up. I will recommend you to any of my friends that want a softener. Right now they think I am building a submarine in my garage. Charles,Thanks for talking to me this morning to program the valves. They work just fine and do more than what I expected them to do. I like the volume used feature on the softener, because over time you can work out the average monthly use of water for your specific family and then use it to fine tune the programming of the valve, and also show the kids how much water they are using up. Installation with two people was very easy. I like the fact that you can hook up the bypass valves first and then just bring the tanks close and hook them up with the O ring hook up. Thanks for the great support throughout the installation. Mr. Moore,I want to thank you for your excellent customer service. You guys made this easy. From your recommendation on systems to the minor adjustments on the control valves you were very helpful all along the way. The system was very easy to install given all of the documentation on the web site. I would absolutely recommend Ohio Pure Water to anyone who is remotely handy and can do some very basic pluming themselves. 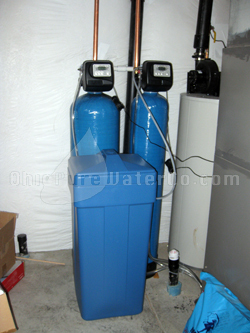 You will save yourself thousands of dollars as Ohio Pure has made this a very easy and affordable process. Charlie/Jean-Thank you both so much for the excellent service before and after the sale of my new Clack WS-1 softener system & sediment filter. I researched softeners extensively prior to purchasing my system and I consider myself very fortunate for finding your website. I could not ask for any better customer service, expert advice, or product quality. I placed my order on a Monday, and my family was enjoying soft water by Thursday evening; all for about $4000 less than I was quoted from a local company a year ago. I never thought I’d be drinking my home’s well water out of the tap, but now I see no reason to buy it in bottles! 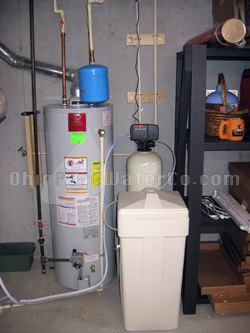 As you’ll see in the attached pic, I have my water heater, pressure tank, softener system and sediment filter in a small 3.5′ x 5′ utility closet with the brine tank plumbed into the garage. It’s a tight fit, but it all works great. Thanks again for your excellent service and product. I’ll be recommending OPWC to all my friends and family. 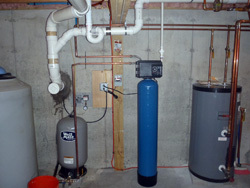 Dear Charlie and Jean:Thank you so much for helping us to select and order the water softener unit for our household! You have provided useful instructions to us, thus made the installation so simple and straightforward. 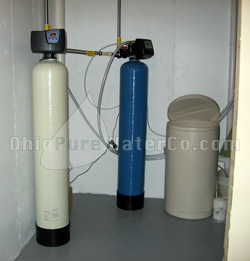 We really think Ohio Pure Water is making excellent products and offer great service! We just completed the (softener) installation two days ago, but we have already felt our water is softer and we’re using less soap. 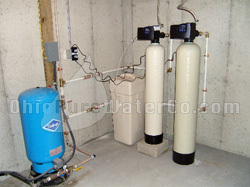 Attached please find a photo that shows the installed water softener system in our garage. Since the flex hoses are utilized in the plumbing system, we may move two tanks closer in the near future. 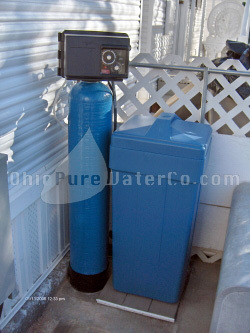 HI There Ohio Pure Water CompanyI am very pleased with my new Fleck 5600 SXT water softner. The installation was easy and the unit has been performing great. Here is a picture of my installation. I have a piece of paper on top of my brine tank that I am using to gauge how much water my family is using on a daily basis so I can get a good idea on where to set my reserve capacity limit at. Thank you for a great product and guidance in setting up my unit. Thank you Ohio Pure Water Company!I ordered my softener a few months ago for a water project at my home. It took a while to install because I was also replacing my water heater with a tankless model and re-routing the water coming into the house. After several phone converstations with Charlie, I now have soft slippery water running through my home. This morning’s shower was great! Charlie is great and the online instructions are wonderful. Talking with Charlie was like going to my neighbor asking for help. Whatever installation questions I had he solved. He is very patient and knowledgeable. I had one small problem with my order. A thumb screw was missing from the valve cover. I called and got a new thumb screw sent out immediately. Not a show stopper by any means but great service all around. When making a decision to buy products online there are many alternatives to choose from and all vendors carry about the same products. Ohio Water Company stands apart from the others. I hope you have continued success. Hello,I just wanted to let you know that I ordered a water softener from your company last week based on your recommendations. I wanted to say that the experience was OUTSTANDING. The order arrived very quick, everything was there, it was well packed, and the equipment is high quality. The best part for me though was the excellent installation instructions I downloaded from your site. It made the process easy and straightforward. I’ll be calling next week for some assistance in programming the Clack unit, but it’s already doing it’s job very well. Great company and product! Thank you. CharlieWanted to tell you how great you greensand system is working. When I started it up I right away ran a back wash then I drained my hot water tank, cleaned the toilet bowl tanks and I had pure clean water. Thanks for your good instructions and some help over the phone. You saved me a $1000.00 labor if I would have had it put in with the company that gave me a quote. 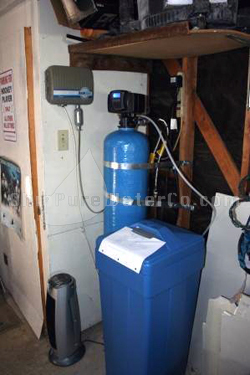 Charlie,Thanks again for all of your assistance on the installation of the water softener. I had reported to you an excess water level in the salt tank, and your suggestion to tighten the plastic fittings for the brine hose must have done the trick. I decided to just wait until the next demand cycle to see if it re-adjusted to the expected level of brine water, which it did. The water quality is outstanding, and from my estimation, this “on-demand” water softner you recommended will pay for itself in reduced water and salt usage in no time! 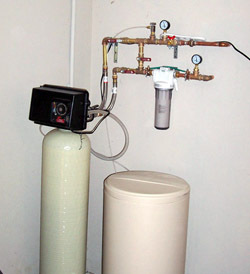 I only wish my old Culligan had failed earlier so I could have been saving money all these years!. Thanks again. I’ve recommended you to several others. Thank you for your kind and helpful service in my recent purchase of a 40,000 grain metered water softener equipped with the WS1 Clack control valve and Purolite SST60 softening resin.Your detailed installation instructions on the internet were excellent and everything fit together nicely except for some minor plumbing modifications required after removing the old water softener. My only difficulty was with the two male plastic NPT connectors provided to connect into my copper plumbing system – they leaked slightly. I used more Teflon tape on the second try (about 8 wraps) and the leak stopped on one side. But the plastic threads started to strip on the other side and still leaked. Thanks for sending a replacement which arrived the very next day. No more leaks now. I used the Purolite SST60 softening resin to save a little salt, shorten required brine rinse times, and hopefully reduce iron fouling of the resin. (My well water has 21 grains hardness and one ppm iron). Charlie gave me the necessary information to program the regeneration cycle specifically for the Purolite SST60 resin by shortening the brine rinse from the factory setting of 60 minutes to 50 minutes. He also told me how to set the program to automatically regenerate 24 hours ahead of time if the reserve gallons capacity falls below a certain amount based upon the daily metered water consumption history for the past week. Please see attached picture: The flexible drain tubing goes overhead to a 3/4 inch PVC drain line leading to a 2 inch drain about 30 feet away. Mr. Moore,Thought you might be interested in seeing my finished product. I used 1â€ PEX to match my main water line common off my expansion tank and Shark Bite connectors to make all the connections. I put in ball valve bypasses as you can see off of the main water line to isolate the system if needed. I ran the Â½ drain lines up and into a 1-1/2â€œ drain from a downstairs bathroom sink I could access from the basement where this system is. The install went pretty smoothly; had to redo 2 joints for leaks but it is fine now. Have had this up and running for about 6 weeks; the system is running flawlessly, my water is clear and no more buying bottled water to drink!! Thanks so much for your good advice and guidance with this system; I’d highly recommend your company to anyone. Good morning,Being a first time amateur installer/plumber, I have installed both the Clack WS1 water softener and the Fleck 7000 carbon filter successfully. They have been working great for about two weeks now without a single problem. The Clack WS1 was a very user-friendly valve to install and program while the Fleck 7000 was a very simple valve to install but the programming interface could be a little more intuitive. Regardless, the setup of these water filters went very smoothly. The hardest part of the installation was to do the plumbing to connect these 2 units to the water line, as a 20-foot long plumbing loop had to be installed to get to the location where I wanted them to be located. 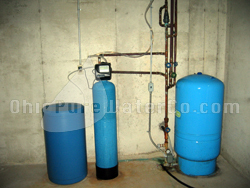 Overall, I am very pleased with the products as well as the service I have received so far from Ohio Pure Water Co. I specifically appreciate talking to Dave, Charlie, and Jean for this project. To show my appreciation to you folks, I have taken some pictures and attached them here for your viewing pleasure. Charlie,Thank you both for your help in selection help and final installation tweaks for my Fleck 5600SE. Everything went smooth as silk! You’ll notice in the photos that I doubled the length of the copper flex lines to accommodate for the taller height of the Flex 5600, replacing my old Kenmore that was somewhat tucked under the stairwell. Also, living in Northern California, note the earthquake strap…just in case. Having dealt with a salt block before, I prudently moved the brine tank out front for accessibility. I used 3/4-inch pvc for the valve drain line which has a run of about 20 feet. Finally, that’s the brine tank safety overflow that runs through the wall to my bone dry crawl space. OPWCThanks for the great prices, products, customer support and installation instructions. At least one friend has since purchased the exact same unit from you guys based on my recommendation. He also could find no better deal shipped nearly as fast. Both orders were waiting on our porch 2 days after placing the order. 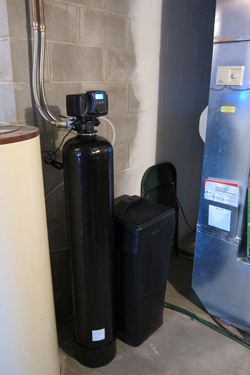 Install was a piece of cake and we saved $$hundreds$$ over some of the water treatment systems out there! I just want to complement your customer service. Jean is awesome! I’ve been researching my water problems on the Internet and making calls to various vendors over the last week to no avail.Once I contacted your company and talked to Jean, I was finally on the course to finding the resolution to my problems. Jean stuck with me helping me through testing my water, analyzing what my needs were, basically walking me through step by step until finding the best resolution and product to solve the issue. Any company can sell you a product but backing that product with good customer service is a rarity these days. I just want to commend you and Jean on exceeding my expectations. I almost can’t wait to buy something else from you. 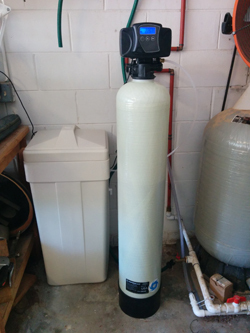 OPWC,Our water softener is now installed and working great. Thanks again for working on this with me in selecting the right size mineral tank (35″). You can see in the pic why I needed a short one! Tell Charlie thanks as well. Hi Mr. Moore,I went ahead and ordered a 64000 grain water softener with the Fleck 5600SE metered valve. I went for the larger unit because in the summer months we usually have five people and up to 10 on weekends. The larger unit seemed prudent. I have to comment that the installation went very smoothly. The instructions I downloaded were very clear and comprehensive. The stainless steel flexible connectors made the installation a snap. 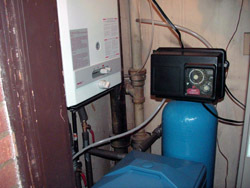 By the way, this unit replaced a Culligan installed in 1976, 31 years ago when the house was built. It still worked, but the valves were leaking (weeping) through the discharge tubing constantly. Culligan wanted $180.00 for new parts and another $150.00 to install them, and I still would have had a 31 year old unit. That money went a long way toward purchasing a brand new Ohio Pure Water Company system. I couldn’t be happier. Hi Jean,I meant to email you sooner, but…. I received and installed the new turbine assembly, and it all works fine. Mr. Moore and Team,Thank you for your excellent support and quick response. Our water was in bad shape from recent water table changes that were causing some turbidity and coliform/intestinal problems for me and my family. We were able to easily install the product you supplied with the well written instructions and new materials all properly supplied, with the help of a professional plumber, who commented that your prices beat the local competition hands down. Faced with the real prospect of having to hook up to a local water company with an expensive and labor intensive line run on both the township and property owners responsibility, we are glad we chose your business to work with. OPWC,Here is a photo of my installation. Everything went very well, and was easy to install. It all works as advertised, and for a fair price. Our water is better than city water for the first time in 30 years. Combined with a storage tank I put in to fix a low-yield well problem too, we just don’t know what to do now with our problems fixed! To Whom it may concern:I wanted to write to you as I said I would in regards to my experience with shower filter. I live in Rochester, MI in an apartment and the water was very harsh prior to installing it. I noticed a difference in the showering immediately as my hair and skin seemed much softer. Two weeks after I installed your filter, this apartment complex spent $16k on a new water system, softener, etc. After that, your filter was even more effective….to the point that I can actually drink the water from the shower tap. CK,I ordered the Rust Out online and before I could turn the computer off, DHL had delivered it. How’d you guys do that!?! It did the trick. I gave it two shots. Thanks! I informed an associate in Alabama that OhioPureWater.Com is #1, AAA, 5STAR. She visited the web site and was impressed. I told here that you guys are my water gurus for life! If I had the cash, I’d startup an OhioPureWater Franchise here. Good service, like you guys do, would bust this place wide open. Here, you’re lucky if the service guy will show up in the same year you made the call! Anyway, thanks again. You guys did it again! Mr. Moore,I placed the order online, with comments about the 7000 valve for the Nitrate system. Thanks so much for your help. I first dealt with Ohio Pure 3 years ago, and your service at that time brought me back this time. I was not disappointed and certainly plan on coming back in the future. My softener arrived quickly and was easy to install. However, there was a problem that occured during the first regen. Some of the resin was blown out of the drain during the backwash.I contacted Ohio Pure Water Co and explained my problem to Mr. Charlie Moore. Mr. Moore was great to deal with. We discussed the problem and decided that I needed to lower the backwash flow rate. Mr. Moore rushed me the new part (back wash flow control orifice). I installed it and the probled was instantly cured. Mr. Moore then sent me more than enough resin to replace what was lost down the drain. I now am enjoying the best water we have ever had in the 30 yrs we have lived here. It took me a long time and a lot of research before I took a chance and ordered my softener online. I’m very happy with it and Ohio Pure Water Co. 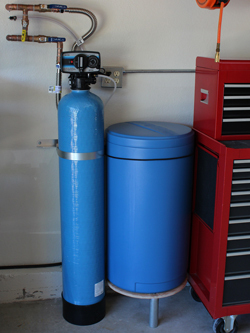 Installing the water softener with the instructions that were given online made it easy to do.The instructions even showed me how to fill my tanks and adjust the float rod in the brine tank. There was nothing missing from the instructions. They were long but very helpful. 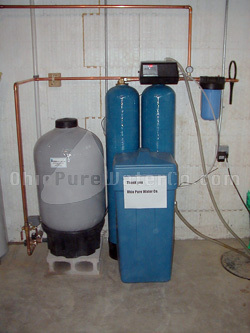 I would recommend anybody wanting to buy a water softener that they buy it from Ohio pure water Co. and they will be able to install it themselves and at the same time save a lot of money. Dear Mr MooreIn my work life I deal with many industrial customers and vendors. And in my personal life, like most people, I deal with stores and online retailers, repair service people, fast food drive-thrus, etc. They mostly provide the wrong products or poor quality, or poor service, and often at very high prices — even in the most simple and straightforward situations. So I am thrilled to have found your company to help me with my somewhat complex home (well) water quality problems. I installed my new water softener without a problem — due mostly to your excellent illustrated instructions. And I am very pleased with the quality of the equipment. And, when I had a question about the master programming of my Fleck 7000 control valve, Jean and Charles offered to call me at home on a Friday evening at 8 pm Ohio time to walk me through the necessary steps. It only took a few minutes with me in front of the unit and Charles on the phone. I’m telling everyone I know about you company. I live in Kinetico country (about 8 miles from their world headquarters in Newbury, Ohio). People around here are used to paying big dollars. So they are really surprised and delighted to hear that they can get straight talk, great products and service, and much lower prices from Ohio Pure Water. After a few frustrating days of calling “Fleck” dealers all over the United States (including the company which installed our unit) and receiving answers such as, “we don’t sell parts, we are too busy, we’ll call you back later, leave a message, that requires a service call, etc”, my web browser displayed your company’s website.I contacted a woman named “Jean” and she spent a fair amount of time helping me analyze my problem, find the correct part to correct the problem, place the order for that part and wish me a Merry Christmas. We are not talking about a complete system here, we are talking about a $30.00 part. In reality, we are talking about excellent customer support from people who know what they are talking about. So, Jean, thank you so much for your assistance. Merry Christmas to all at Ohio Pure Water Company. Ohio Pure Water Co,I received my order on Tuesday after ordering it on Saturday. I am really impressed with your service. You kept me more than adequately informed all along the way and were astoundingly quick. I already have my brine tank repaired and back in service. I have bookmarked your website and your company will be my first choice for all my softener repairs and purchases in the future. 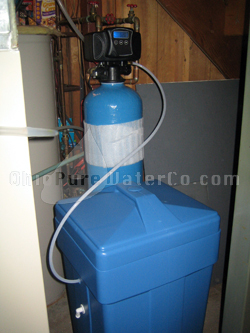 After doing our due diligence we chose Ohio Pure Water Company 1) expert advice on current water conditioning needs 2) a product with excellent quality / reputation. 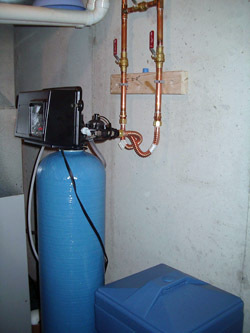 The installation was straight forward, interesting project assembling the water conditioner. To help with our well water odor we choose the optional media filter KDF85. 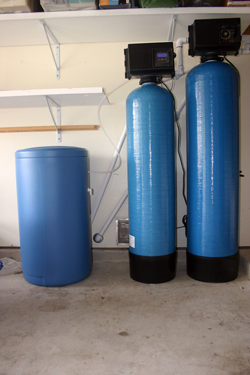 Results are outstanding, compared to our original installation Culligan, we now have quality water. Dear Charlie and the Ohio Pure Water Co. crew,I just wanted to write to say thanks for the excellent installation instructions available on your website. Thanks for the tips and advice as well, Charlie. The installation of my softener couldn’t have been more clearly illustrated. 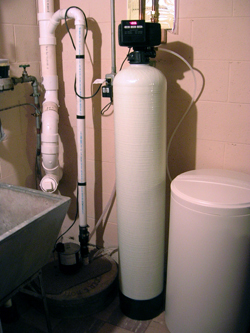 Here’s a shot of the softener and sediment filter installed. I think I need to add one more ball valve to prevent backflow from the house lines when changing the sediment filter, but other than that, it’s working perfectly. 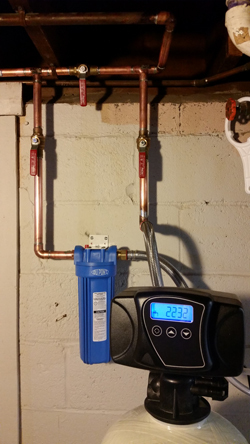 Thanks for all the help, the fine web site instructions, installation book, and your step by step “how to” over the phone.Here are some photos of our new, model 2510 water softener that my wife and I installed yesterday in less then four hours. Notice the suds in the sink. My sister who just arrived last night couldn’t believe how much rinseing it took to get the soap off of her face. The water is drinkable from the tap, may be able to get rid of our reverse osmosis unit. No chlorine now. 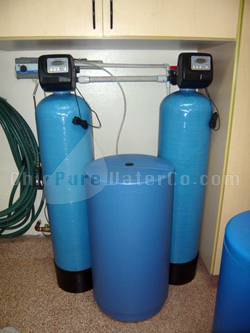 HelloI received my new water softener (2510 SE) 6-6. Installed today, 6-7. I am no plumber, but due to your web site, offering very simple easy to follow instructions and pictures, the installation was a breeze. Only took a couple of hours total time. This installation was a replacement for my 10 year old Cole-Massey softener. When my iron filter gives out, I will replace it with your filter of course. Thank you for a great product at a great price (and free shipping!) You saved me about a thousand dollars. 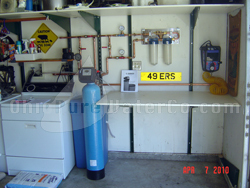 The local plumbing company wanted $1695 for comparable equipment–no installation included. 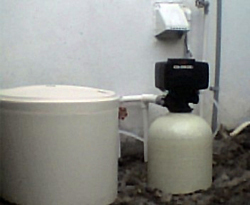 The new unit is now in the second stage of it’s first regeneration and working perfectly with no leaks. 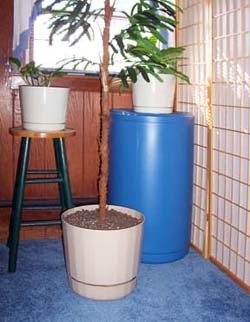 Hello,Attached is a photo of my new water softener. Feel free to put it on your website. We had our first regeneration which went well. Dear Ohio Pure Water:First order of business; I would like to thank Mr Charlie Moore for such an excellent explanation of the two systems of water treatment I was inquiring about, Greensand and Chlorination. I have been in a predicament that has terminated my trust of any local companies that offer similar products as they have reverted to traditional salesmen that are out to oversell what is actually needed and take advantage of the less informed. Let me begin by stating that none of that occurred with Charlie. I was delighted to get straight forward answers to my questions. I know you think that would be common place in most business but let me state that yours was the first company, I have tried 4 local and 3 Internet, before coming to yours and getting the facts and friendly help that he provided. This is extremely significant considering I am getting help from Ohio when I reside in the Tampa Florida area. He is an extremely valuable asset to your company and if you ever decided to venture into the Florida market I would recommend him as your leading representative. 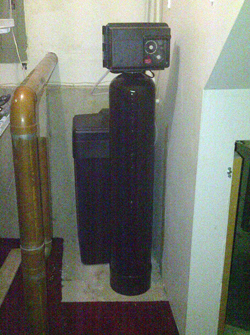 As promised, a picture of my new water softener. Believe it or not, there is a furnance, tankless water heater and the 2510 in a space the size of a small closet. We had a 50 gallon water heater and no room for the softener.It (the water heater) was old and we replaced it with an Aquastar 125B tankless heater. Not only do we have unlimited hot water, but unlimited, soft hot water. Again, thanks for everything. I can’t imagine calling Sears or Home Depot with a regeneration question and getting any kind of a real answer. You are a top rate dealer and I will gladly recommend you to all of my friends. I have finished installing my Fleck 2510. Everything appears to be operating fine. You can include the following in your Testimonial Section.The Fleck 2510 arrived in 3 days. The online instructions made installation simple. The same day email response appears to be standard. 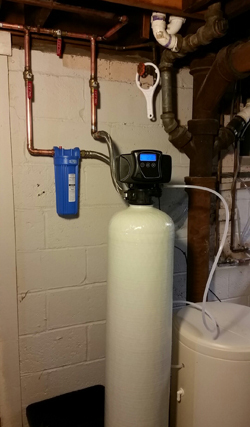 If you can install a sprinkler system with an electronic timer you can install one of these water softeners. I saved $900 buying this unit from Ohio instead of purchasing it locally. I just wanted to drop you a quick note about the water softener I ordered last week. I can’t tell you the last time I’ve been so happy with both a product and the customer service I received from an Internet purchase. I ordered my system ( Fleck 5600 Timer Control Valve Water Softener) on a Sunday night, it was sitting on my front porch when I got home on Tuesday, I had it assembled that night and completely installed by Wednesday evening.I couldn’t be happier with the way things went. In fact, I went out to bizrate.com and left you guys a positive review. I hope people will read it and direct their business your way. Just for the heck of it, here’s a picture of my system, installed. Actually, this shows just the brine tank. The resin tank sits behind the shoji screen. Eventually, the whole system will sit in a utility closet, but this arrangement will work for now. Thank you Ohio pure water. My order arrived at my house on time and as promised. Looking forward to doing more business with you in the future. Wished I knew about you last year, could have saved alot of money.Thanks again. Just want to pass along that my experience with OPWC, the Fleck water conditioner and on line support has been great and as advertised. Even though a bit anxious about the process, the on line directions were clear and easy to follow and so far I’m very pleased with the unit.Enclosed is a picture of this “part time” plumber’s installation. Keep up the good work OPWC! 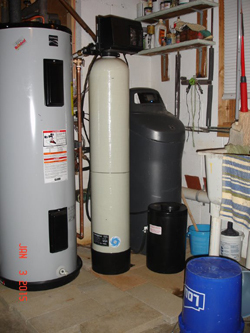 I recently purchased a water softener system from you, and I just want to let you know how satisfied I am with your service and products. I ordered the system on a weekend; you shipped it on Monday and I had it on Tuesday. I put the system in the following weekend and it works great. It’s a 48,000 grain unit with the Fleck 2510 Demand Controller.I had considered buying my new softener from a local company, but they wanted double your price for the same equipment (installed). Of course I had to install your system myself, but I saved enough money to replace my pressure tank and all the associated plumbing. And I still have money left over for an RO system. Completed the installation this past weekend. All went very smoothly and am enjoying the soft water. Attached is a photo of the installation. I replaced an old softener which had been out of service for many years. Since I live in Florida and freezing temperatures are not a problem I buried similarly to where the old unit was located, then did a few customized modifications and I was in business.Thanks for all the support from start to finish.